Plated for your chocolicious delight! Guess what? Remember when I posted about how I had entered the Apple Crisp Recipe Competition for the Canadian Baking and Sweets Show? And how I was a finalist? It took place this past Saturday, and…I won! I came home with a gorgeous gift basket of cupcake-baking supplies as well as a cookware set worth $500. Was very exciting! The recipes of the finalists were sent out to a third party kitchen to ensure that they were replicable, and the judges tasted the dishes in front of the crowd at the show. The DH was there when I won, and he is just the sweetest guy. He’s so proud of me! I mean, I’m proud of me too, but I recognize it was just one contest. The DH? Sent emails to my family, his family, and his coworkers, and mentioned it in phone calls to his friends. Like I said, isn’t he just the sweetest? I do heart that man! And speaking of sweetness, I just made some Chocolate Bubble Éclairs for the latest in my online bake-a-long with the Baking Chez Moi group. Although technically they weren’t BUBBLE éclairs. But I’ll get to that in a minute! Whenever there are three Tuesdays in the month, the third Tuesday is time for a “rewind” — whatever recipe you missed or wish to redo, that’s what you do. I had made the Crackle-Topped Bubble Éclairs previously, but while the crackle topping was fabulous, the éclairs fell once out of the oven. My takeaway from that trial was that one must leave the éclairs in the oven longer that one thinks, until they look almost too brown. So that’s what I did this time! And they turned out great! 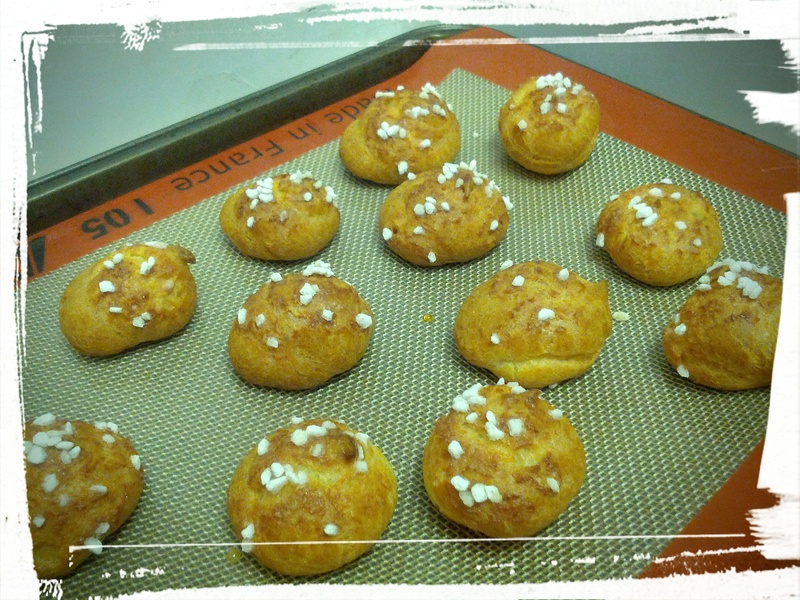 Except that I didn’t pipe them close enough so they turned out to be more cream puff than bubble éclair. Oh well! I used pearl sugar on top as opposed to the crackle topping that I did last time, and I’m rather pleased with the result. Although I ran out of eggs, so I didn’t do an egg wash prior to sprinkling on the sugar. They still turned out pretty perfectly! I’m really happy with how these turned out! 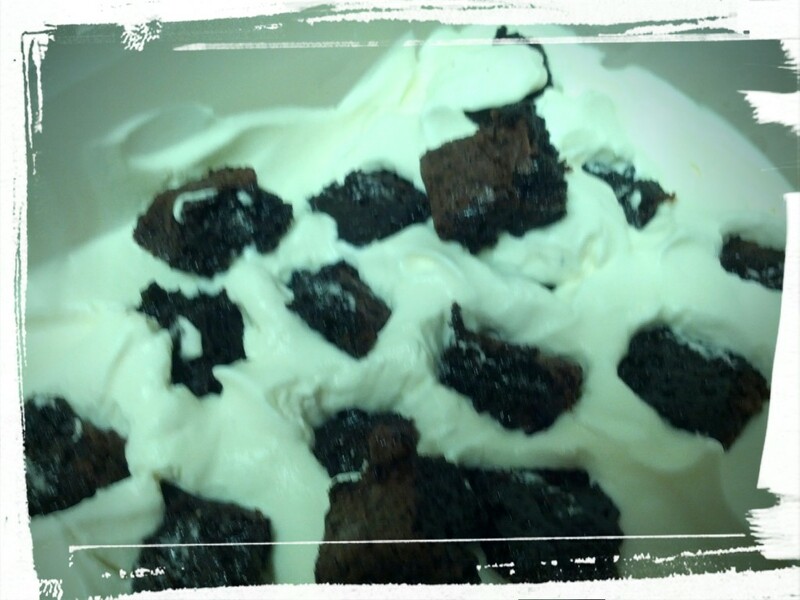 I filled some with regular Whipped Cream, and some with a sort of Dark Chocolate Expresso Whipped Cream. I melted some 90% Dark Chocolate with some butter and milk and once cooled, blended it with some whipped cream and instant coffee granules. If you don’t like your sweets too sweet, this is the filling for you! You can really taste that almost bitter dark chocolate — these were definitely my favourites! I’ve packed them away for the DH to take to work tomorrow (20 dark chocolate expresso ones and 20 whipped cream ones. Oh ok, 19 and 21! I couldn’t resist one last chocolate one *grin*). I know that éclairs/cream puffs/whatever you call them are best the same day, so I hope they hold up until the DH gets to work tomorrow. Eh. Worst case, they’re just not as uber-fresh as right now. I think they’ll still taste nice on a coffee break, right? Next Post: Am dreaming of my favourite bok choy dish, but will likely my long-promised homemade peanut butter cups and wine jelly bonbons. Mmm…they’re all so good, how can I choose? This entry was posted in Blatherings, Cook-a-Longs R Us on September 29, 2015 by Margaret. 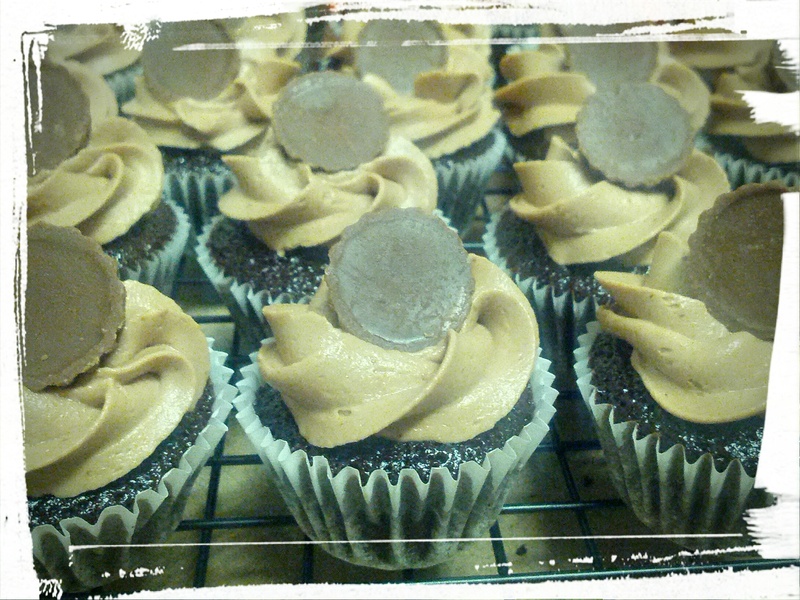 Mini Reese’s Cupcakes: The Perfect Mouthful of Chocolate & P.B.! Want. Want ALL the cupcakes! Ever since I came across the new Reese’s spread, I’ve been wanting to try it out. As 0ne of my colleagues said, it tastes exactly like the inside of a Reese’s Peanut Butter Cup. But more chocolate-y! So when I found a jar on double-sale (on sale at the store, plus a rebate using a coupon app), you know I HAD to buy some! The DH doesn’t actually like chocolate, so…more for me! Bwahahaha! Naturally I had to take this delicious spread and turn it into a cupcake. I mean, obviously. What, was I supposed to eat it on bread or something? Pffft. Blend butter and shortening together. Add in icing sugar and blend again. Add in Reese’s spread and Nutella and blend a final time. Taste test. Lick fingers. 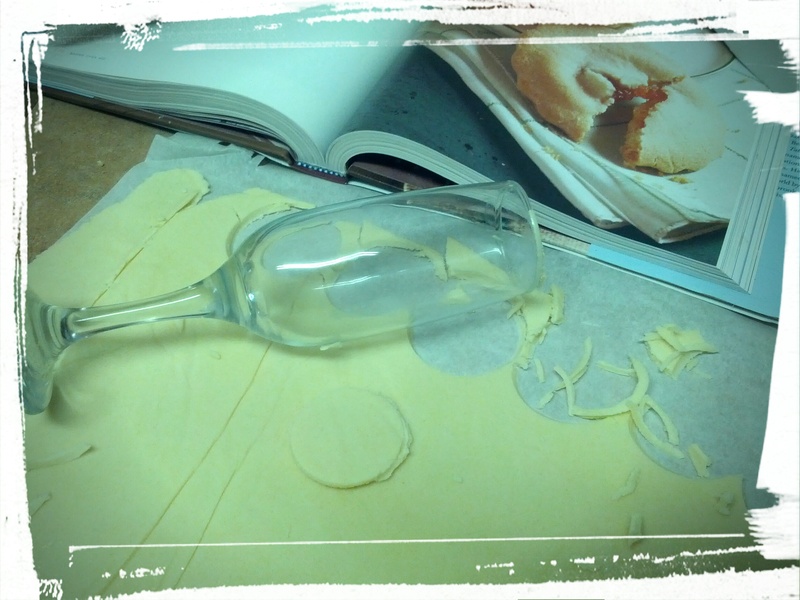 Using a Wilton 1 M tip for that professional look (or whatever you have lying around the kitchen. An sandwich bag with the tip cut off works too! ), pipe the icing on the cupcakes. The recipe I used made about 50 mini cupcakes, and there’s enough icing to pipe a bit on each one. Then pop a mini Reese’s Peanut Butter Cup on top, and you’re done like dinner. Or in this case, dessert! Close-up of the cupcake action. Next Post: Vegetables. Maybe. Or maybe…homemade Peanut Butter Cups! 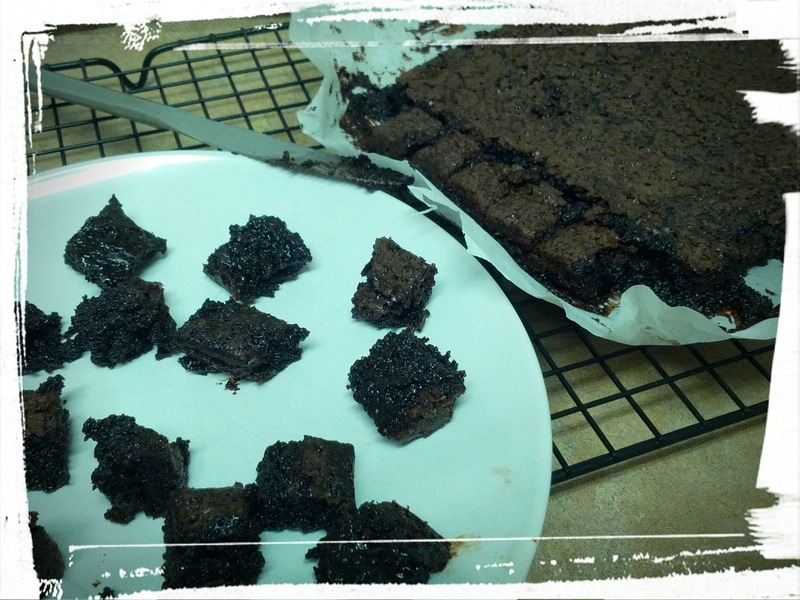 This entry was posted in Cakes on September 24, 2015 by Margaret. 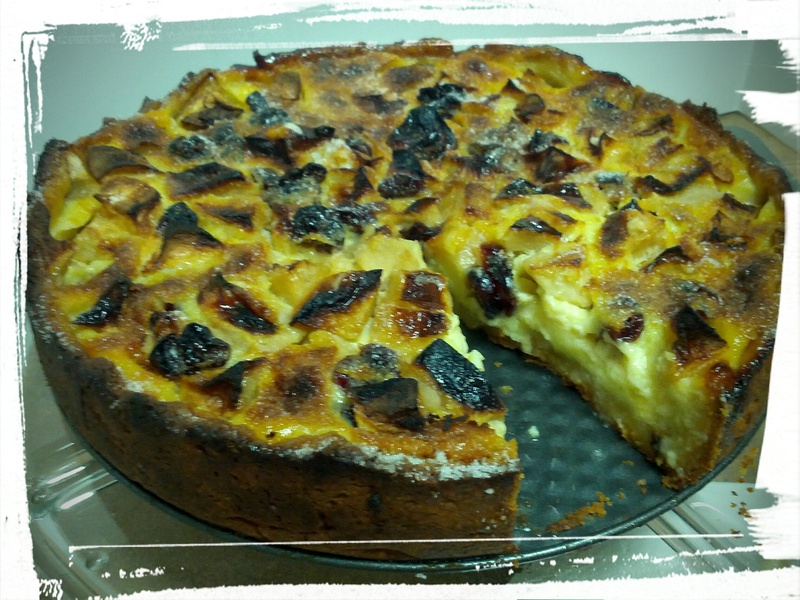 All Things Apple, or Let Us Eat (Apple) Kuchen! 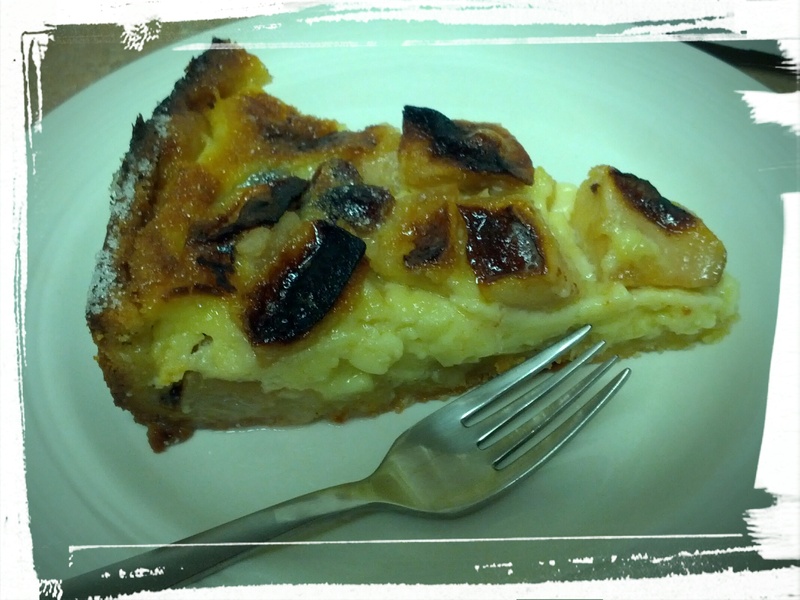 Apple Kuchen: Not sure whether it’s a custard or a tart, but it’s definitely yummy! I have so many apple-y things to talk about that I don’t know where to start. So I’ll just dive right in! 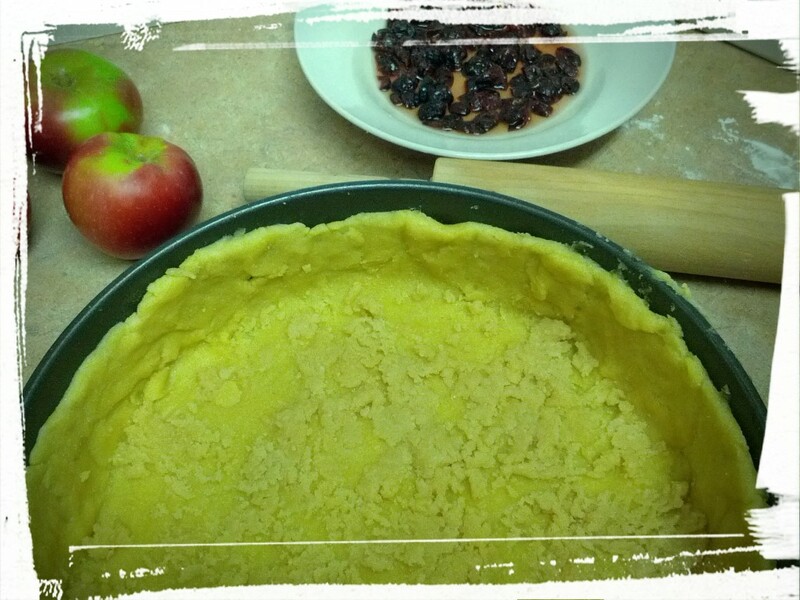 This week my on-line bake-a-long group is making Dorie Greenspan’s Apple Kuchen, from her Baking Chez Moi cookbook. It’s a cross between an apple tart and a custard, and reminds me so very much of my Opa’s Appel Taart (Opa is what the Dutch call their Grandfather. Germans do the same, incidentally.) My mum still reminisces about my Opa’s Appel Taart, how it was not too sweet and not too tart, how the apples were grated, and how the crust was less flaky and more crunchy. One day I’ll find the perfect recipe to replicate that recipe for my mom, but until then, this is the closest that I’ve seen. 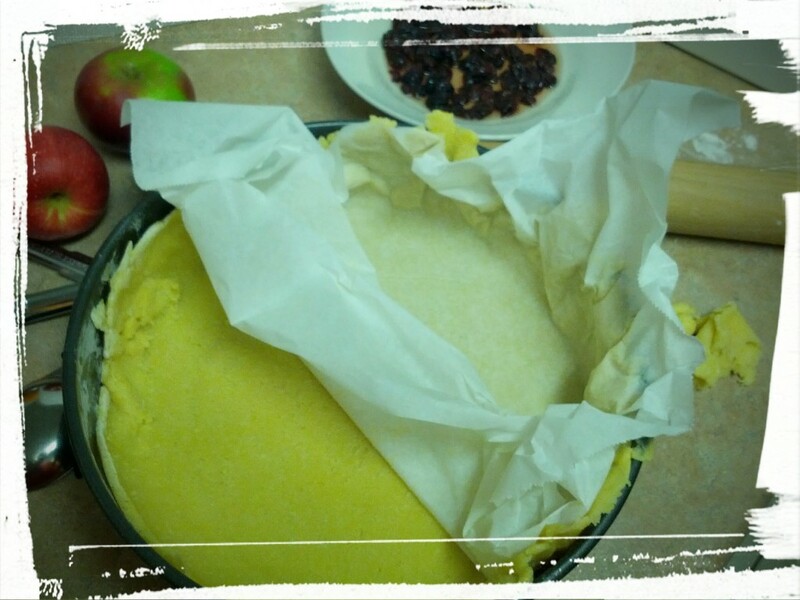 This kuchen (German for cake — hey, you get a language lesson along with my blog post! *grin*) is made in four parts. First you make the dough which, quite honestly, can be a bit fiddly to make. I had to add two tablespoons of water to make it stick together, and then I did what Dorie suggested, and rolled it out on some parchment before placing it in the springform pan. It came together relatively smoothly, but from reading some of the other members blog posts, that wasn’t the case for everyone. Then you mix up a graham cracker and butter crumb mixture to spread across the bottom of the pan. 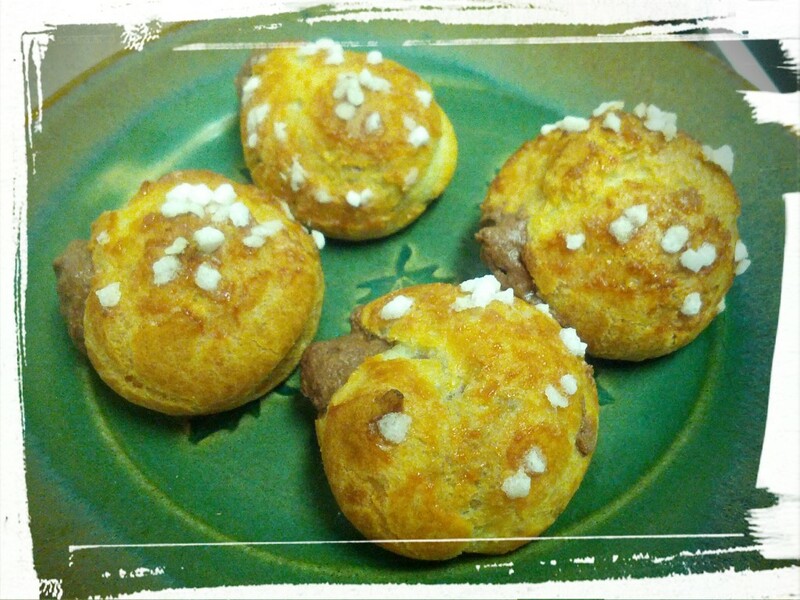 Dorie says that you can also used crumbled Petit Beurre biscuits. I had neither and did not feel like an extra trip to a store to pick some up. As it was, I had to pick up the butter, eggs, and cream from a pharmacy/food store on my lunch break; I did not want another shopping trip after work as well. 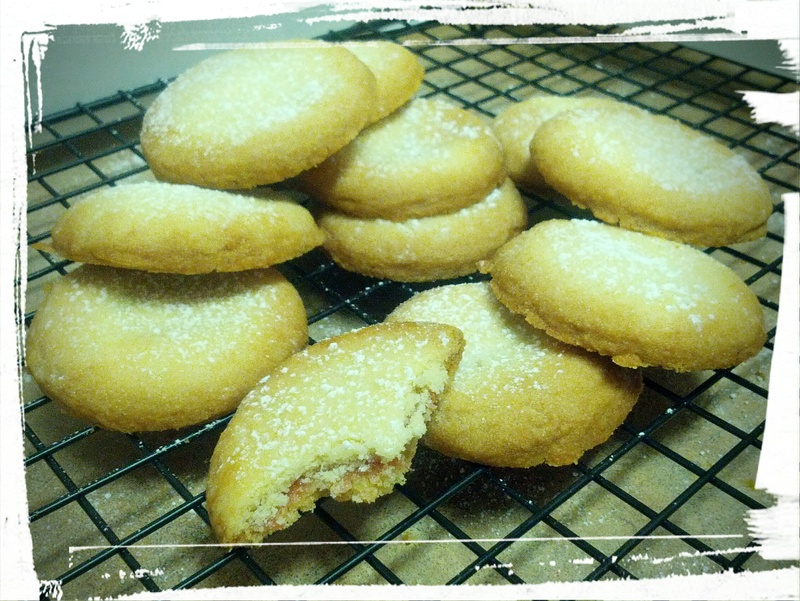 So me being me, I used a mixture of ground almonds, regular flour, and butter. I figured that it was basically to absorb the juices of the apples and to sort of seal off the pastry crust from the custard. So ground almonds for texture and flour for its absorptive properties. Next up is the apples. I actually went apple picking with the DH yesterday, so these Ontario McIntosh apples are just about 24 hours off the tree. Nice, huh? I plan to make apple butter and apple crumble with the (many) remaining apples. And speaking of apple crumble, guess what? I’m a finalist in the Apple Crisp Home Baking Recipe Competition in the Canada’s Baking and Sweets Show! The bake-off, with the recipes being prepared by “expert chefs”, is this weekend. Wish me luck! 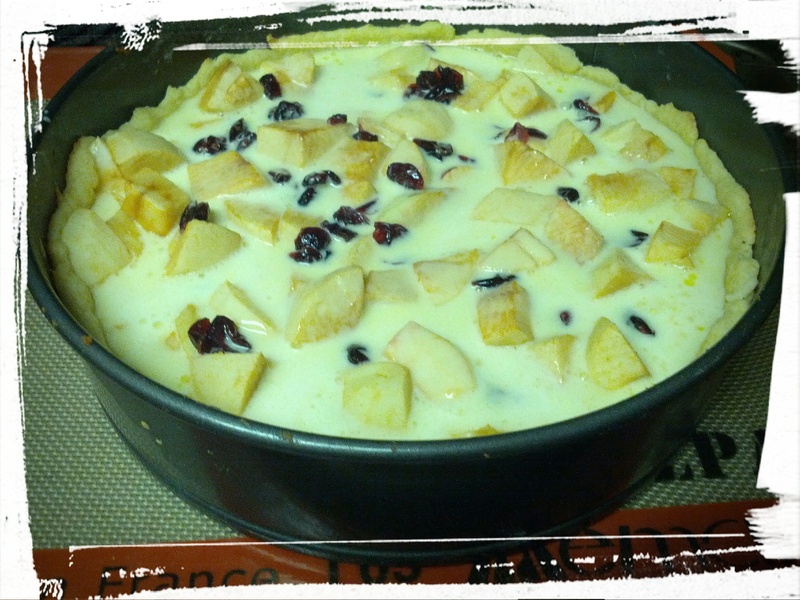 Apples and rummy cranberries. Yum! But back to our kuchen. So you chop up the apples, and sprinkle some rum-soaked cranberries on top. Technically it’s supposed to be rum-soaked chopped apricots or raisins, but eh, because again I was trying to avoid yet another shopping trip. So cranberries it is! Close enough, right? A nice rich custard, prior to the second baking. 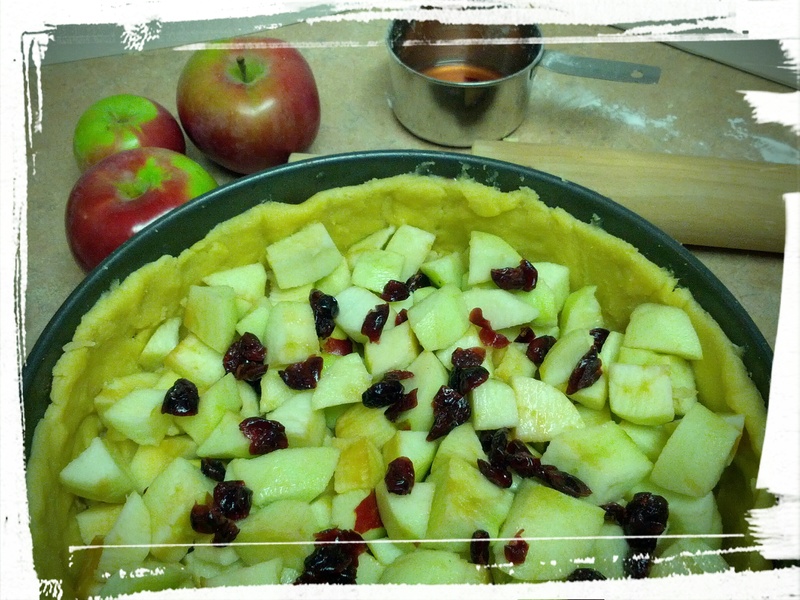 Then you pop the whole thing into the oven for 15 minutes, to sort of pre-bake the apples and crust. Next you mix up the custard out of eggs, sugar, and cream (or crème fraiche) and pour it on top the semi-baked kuchen. Bake that baby for 60 minutes(-ish), then sprinkle some sugar (I omitted the butter) on top and broil it until it’s bubbly, and you’re good to go! Best to let the kuchen cool a bit before eating it, so that the custard sets up, but really, when dessert smells this good, who wants to wait? Not I! 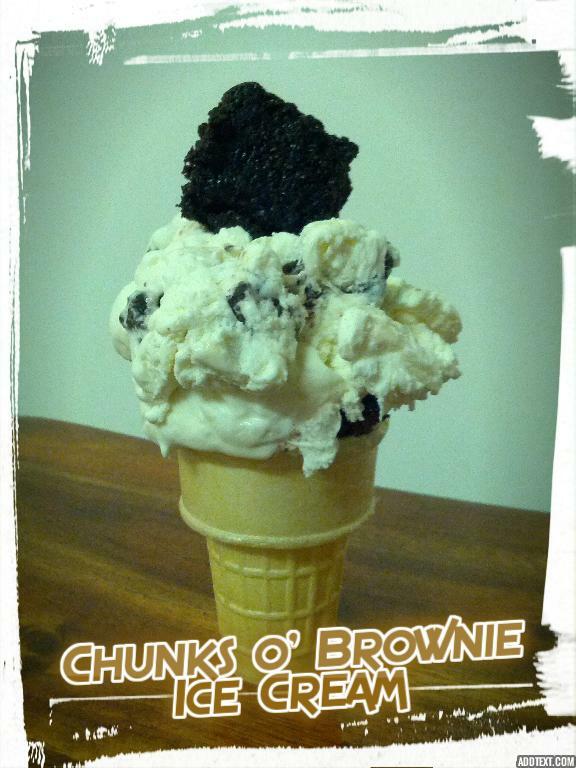 Interested in reading about how others made this recipe? Check it out here! 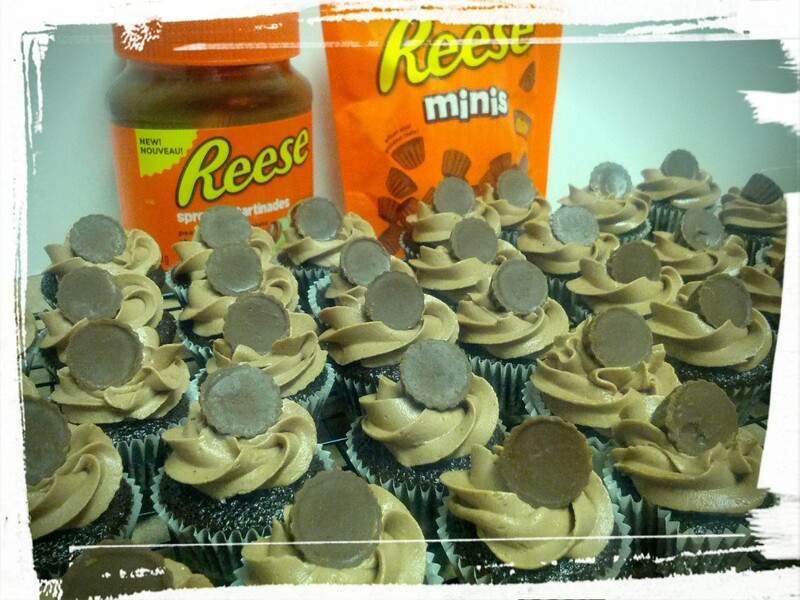 Next Post: I’ve been dreaming of Chocolate and Peanut Butter Reese’s Cupcakes ever since I bought some Reese’s spread on double-sale, so that’s likely going to be next! I plan to counteract the effect of all this sugar by consuming the 10 lbs of beets that I have sitting in my kitchen. Probably in pickled beet form. Mmm yum! This entry was posted in Cook-a-Longs R Us on September 23, 2015 by Margaret. Perfectly golden, perfectly crunchy, and perfectly delicious! Make the dough, roll it out, cut it into little circles (I used a champagne glass to cut the circles out). Place a spoonful of jam in the centre of one circle (I used some homemade strawberry rhubarb jam because that’s what I have open in my fridge). Run a wet finger around the edge of the circle and place another circle of dough on top. Press the edges to seal. And whamm-o! into the oven it goes! Rotate sheet in oven and finish baking. Eat (try not to burn your tongue). 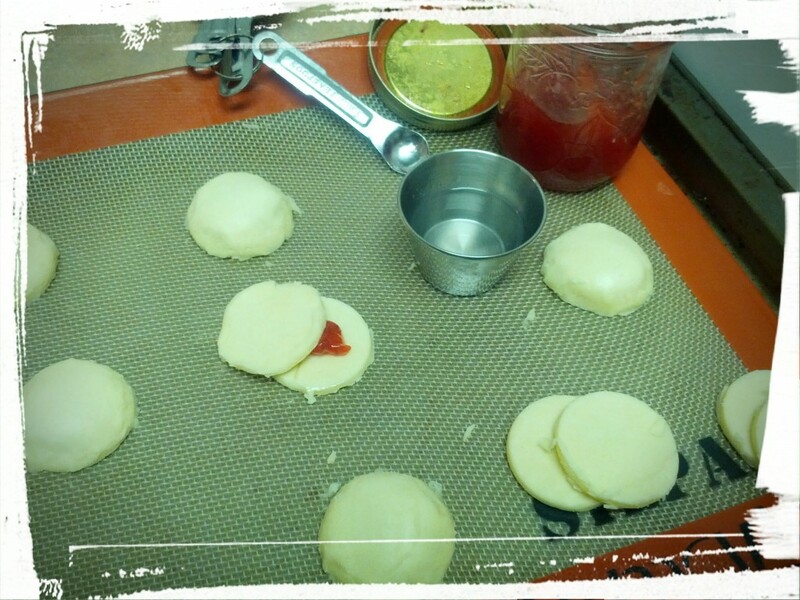 Sandwiching the layers of dough together with homemade jam. The last step is definitely my favourite! As I type this, there’s a cat trying to walk on my lap and/or the keyboard, which makes typing a little difficult. I doubt that I’m the attraction; most likely the cat is trying to get a taste of cookie off me. This is a very curious cat, let me tell you — it actually likes chickpeas (plain and in falafel form) and watermelon (let’s just say that I had some unexpected help finishing off a watermelon smoothie when I left it on my bedside table once). A cup of tea and thee = happiness! Would I recommend this recipe? Yup! 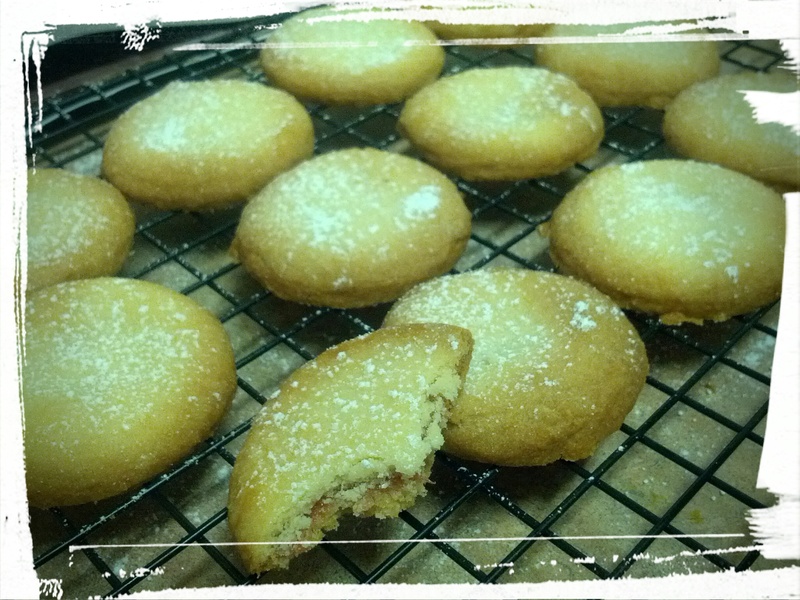 It’s nothing fancy, but it’s a nice little cookie with a hint of flavour, and easily customizable. With, say, Nutella! I’d probably put in more jam next time, but hey, live and learn! I wonder what everyone else did? Next Post: My copycat Reese’s Peanut Butter Cups (with a grape jelly bonbon variation thrown in). This entry was posted in Cook-a-Longs R Us, Cookies on September 9, 2015 by Margaret.